Testing out video reviews, so the video quality is terrible. I have been eagerly awaiting the release of ModNation Races since it was first announced at last year’s E3. The initial idea I had from seeing the footage of how quickly you can make a track and the racing left me with a thought “Wow, this is gonna be an awesome PSN title” … wait. Actually, it’s a full $60 release. To those that are scared by the kart racing genre, about $40 too much. First of all, you have to consider this; almost every kart racing game that has come out in the last few years or more has been an after thought. Kart racing was a genre that developers used to milk a currently declining franchise until it expired or got a reboot. Crash Team Racing, Sonic All Star Kart Racing, South Park, Nascar Karts … the list goes on. However, ModNation’s original idea is kart racing; there’s no spin off from a platformer or random IP. This is a one of a kind kart racer. So is an original kart racing theme enough to render my, or your $60? Sadly, no. Luckily, MNR has a few more tricks up its sleeve. Let’s take a look. Customization – now were talking. MNR takes the LBP mantra of “play, create, share” and applies it to race tracks. Did you play LBP? Were you unable to figure out the tools to create levels? Then this is for you, because creating a track can be as simple as driving in a figure eight and then pressing the “auto populate” button, and that’s it. You’re done in less than 2 minutes. If you’re the more technical type, like me, you can spend hours tweaking each bank, getting the prefect width for the straight-away, and making sure all your jumps land exactly where you want them to. Personally, I’ve spent about 8 or more hours creating a track, and I cant wait for my next project. Creating a Mod is a snap too. This is more reminiscent of LBP, with the applying of clothing items and then finalizing it with custom stickers. The sky is the limit, and seeing as how the top created and downloaded Mods at the moment are Mario, Ironman, and Spiderman, I don’t see United Front bringing the ban hammer down on licensed creations. Once you have created a Mod, a Kart, or a Track, you can then post it online for other users to download and use themselves. Want a Mario Mod? Too lazy to make one? Search Mario online and hit download; it’s that simple. Of course a kart racer is nothing if it’s not fun to play, and ModNation doesn’t slouch in this area either. I’m just going to come out and say it… this is a better kart racer them Mario Kart. “ZOMG NOWAI HE JUST SAID THAT” … yes, yes I did. And I mean it. You may prefer the “charm” of Mario Kart to ModNation’s urban vinyl characters, but there’s no denying that MNR plays like a hot knife through butter. Linking drifts together is second nature. A 3 tiered weapons system where you can hold onto a power up and upgrade it by picking up another is a dream. And of course, the shield. Yes, a shield. 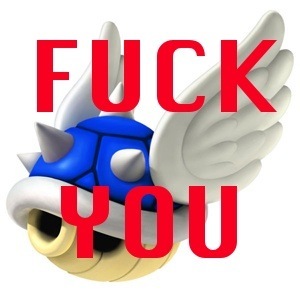 Blue Turtle Shell be damned, because with a little skilled timing you can deflect any attack on your kart using your boost gauge, thus giving you a reason to keep it full even if you’re in 1st place. I could go on, but I think you get the idea of how well made this kart racer is; but even with all its flair, it’s still rough around the edges. Load times – everyone who reviews this game complains on and on about the load times. Yes they are quite a bit longer than you would expect in a game like ModNation, but the fun you’ll have on the other side of that load screen is worth waiting for. The Mod Spot is where you and a bunch of other drivers can hang out and drive around before deciding to join a race or enter the career or go the the creation station; it basically doubles as your main menu, which is cool in theory. Until you add internet lag. Sometimes a simple task like entering the Mod Spot, or driving over to quick race and press square… huh? It doesn’t work? Drive away, come back… nope still not working. You will notice at the bottom of the screen is a circle loading icon; this means it is trying to populate and load the mod spot. There have been times where I had to wait until that finished before leaving again. It’s annoying, but not a deal breaker. CrissCross CRASH!! Sounds like a hot wheels commercial, right? So you want to make a track that crosses through itself to create potential t-bone crashes? Yeah, ’bout that.. You can kind of make this work, but the game’s track building system was clearly designed without this in mind. If you plan to make a track like this, make sure you know a friend who was good with LittleBigPlanets more complicated tools. Because while it is possible, it’s not very accessible to causal track builders. While Modnation has some hitches, and a couple that might bother some more than others, it is still hands down the best kart racing game to come out in at least a decade. I know that’s not a hard title to smash, but at least somebody did, and they did it quite well. I’m not regretting a single penny of the $56.98 I paid for it.